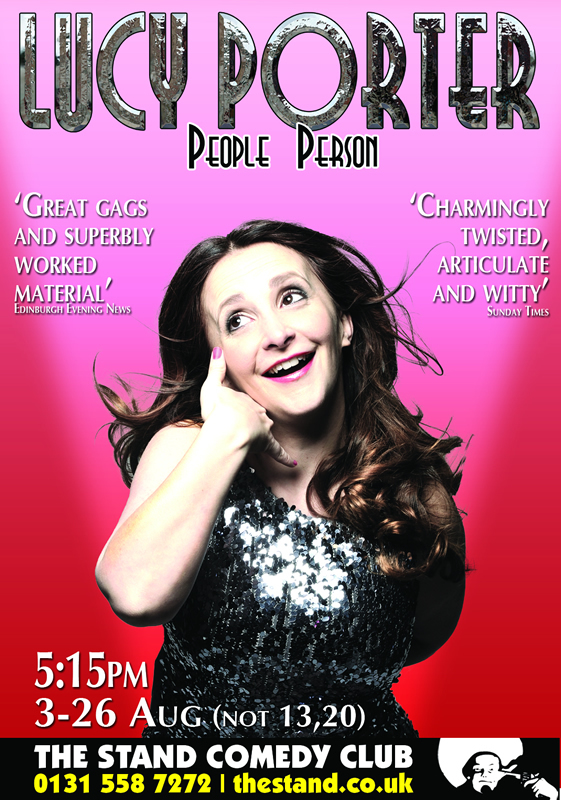 Lucy has now taken 11 solo standup shows to the Edinburgh Fringe, and toured many of them around the UK & beyond. See below for more. A brand-new, brilliant hour of stand-up from this perennial Fringe favourite. In these combative times, it’s easy to be irritated, offended or downright enraged by other people. How do we know which causes are worth fighting for? Lucy uses her hilarious experiences to help you decide. Lucy had a list of things she thought she would never be: Monogamous. A mother. A cat lover. A slow-walker. A change-counter. A miser. Someone who listens to chart music. Someone who listens to Vanessa Feltz. A sentimentalist, a nail-biter, a foot-spa owner, a glasses-wearer. Someone who’s been arrested/ dumped/ sacked from their dream job. A meat-eater, a real-ale enthusiast, a caravaner, a luddite, an evangelist, a teacher. One by one, Lucy has crossed each of the imaginary lines she had drawn in the imaginary sand. In this show she works out whether there have been any real consequences. The big issues covered in Lucy’s latest hour include: censorship, generational conflict, theological ethics, safe-spaces, transphobia, real-ale vs ginger ale, trivia quizzes (particularly Radio 2’s Pop Master), Britpop of the 1990s, falconry and Gary Wilmot. In fact, the whole hour is pretty much a love letter to Falconry, Gary Wilmot and Pop Master. This is a heart-felt and hilarious hour of personal revelation, political observation, and general reflection. Lucy is delighted to be called a ‘veteran’ of the Edinburgh Fringe, she has also been described as a ‘stalwart’ which she loves. This year her ambition is to be classed as a ‘powerhouse,’ ‘expert’ or ‘virtuoso’. The 10th solo show from this Fringe favourite, familiar from radio (The Unbelievable Truth) and TV (Mock the Week, HIGNFY). Finding modern life a bit difficult? Maybe you were born in the wrong era. In this show Lucy tries to find her rightful place in history. She ponders whether she’d rather be a be-whiskered Victorian explorer, a 1920s Hollywood starlet or Hatshepsut the Egyptian pharaoh. 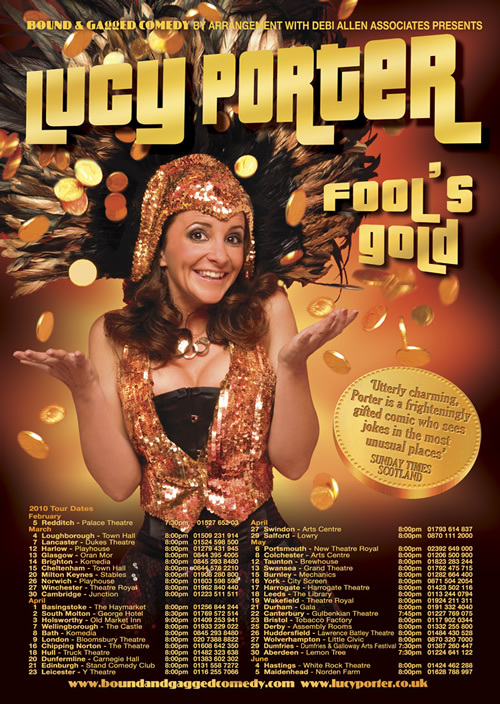 Lucy Porter, familiar from popular TV and Radio panel shows such as Never Mind The Buzzcocks, Mock The Week and The Unbelievable Truth, returns to the UK tour circuit, fresh from The Edinburgh Fringe Festival, with her best show yet. Does geography shape our destiny? Born in Croydon to a Northern Irish dad and a Midlander mum (who met in Africa), Lucy never felt that she belonged down South. She tried moving to Manchester, marrying a Welshman and travelling the world, but she’s still – like the littlest hobo – seeking her spiritual home. ‘People Person’ is a guide to the human condition that draws on Lucy’s academic background as a student of social anthropology, and her social background as a party animal. As a comic on the international circuit, Lucy has met thousands of people. Now that she’s no longer such a road-dog, Lucy has discovered that there are equally fascinating folk closer to home. This show combines extraordinary stories in exotic locations with similarly startling tales from the more mundane domestic sphere. You’ll hear how Pamela Anderson tried to get Lucy killed in Vegas, and how a more recent criminal plot unfolded in a Camden Town hairdresser’s. Are human beings inherently good or bad? Is it better to be lonely or surrounded by twats? Is Gloria Hunniford the principal cause of post-natal depression? In these times of recession, gold is prized more highly than ever, as other forms of currency grow worthless. What’s so special about gold? The show will feature live alchemy, a tribute to Mr T. and a very valuable, big gold thing with security guards and everything! 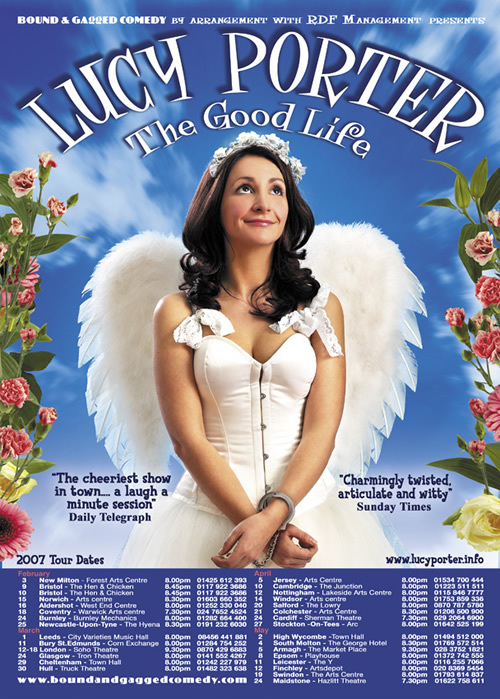 Since 2001, Lucy has been a huge hit at the Edinburgh festival with her distinctive, bouncy, feel-good comedy. There’s always a philosophical element to her shows, and The Bare Necessities is Lucy’s least fluffy, most thought-provoking show to date. The erosion of our civil liberties, the rise of surveillance society, the infantilization of grown-ups, the reason why so many comedians are depressive alcoholics and the ingredients for a really excellent dirty martini. Self-confessed love addict Lucy is going cold turkey just long enough to try and wrest control of her life back from her misty-eyed impulses. The Jungian psychoanalyst Robert Johnson describes romantic love as ‘the single greatest energy system in the Western psyche‘, but is the quest to find “the one” really the greatest goal we can aspire to? Are you in your late twenties or older, and slightly worried that you’re not really a ‘good’ person? Worried that the legacy you’re leaving for future generations’ amounts to little more than a mountain of debt, a mountain of non-biodegradable rubbish, and a mountain of thoughts and opinions that add nothing to the advancement of the species? 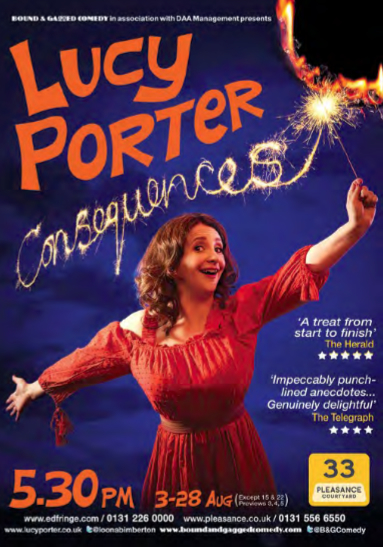 Lucy Porter is worried about all these things and plenty more besides. Can a drinking, gambling, all-round hedonist ever consider herself to be morally good? Can an avid consumer of cheap airfares, pop culture and cheap clothes ever be good to the planet? 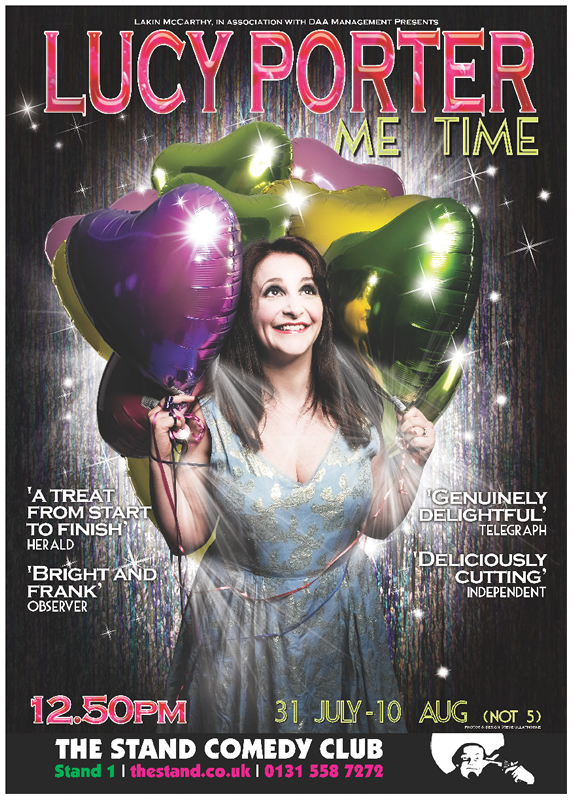 Can a bubbly, affable, happy comedienne ever be really good at delivering stand-up that affects other people? A DVD of The Good Life is available via GoFaster Stripe, and can be bought here. 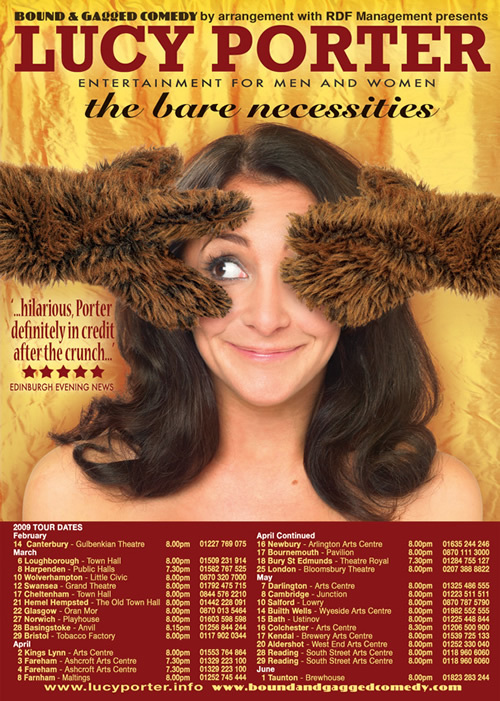 Lucy Porter is in her 10th year as a successful and respected stand-up comedian, writer and actor. 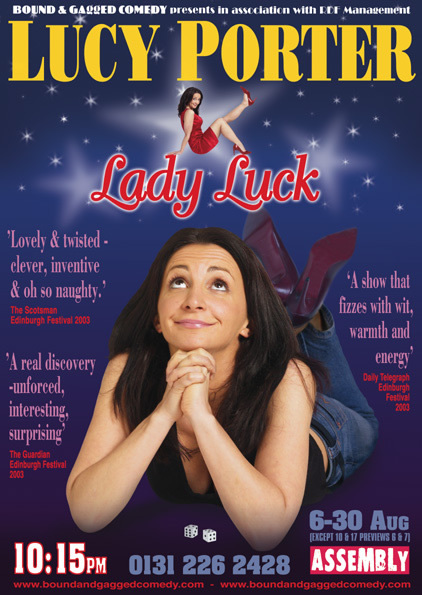 Last Edinburgh, for her third solo show Lady Luck, she won the coveted Fringe Report award for Best Stand-up which also garnered critical acclaim and full houses. The diminutive comedian grapples with the huge subjects of luck, chance, fortune, fate and karma. The definitions of, and distinctions between, these terms are fascinating and highly pertinent subjects. After all, the nation seems to agree that David Beckham is fortunate to have been born with an immense talent and the capacity to express it, whereas Victoria Beckham is just bloody lucky. 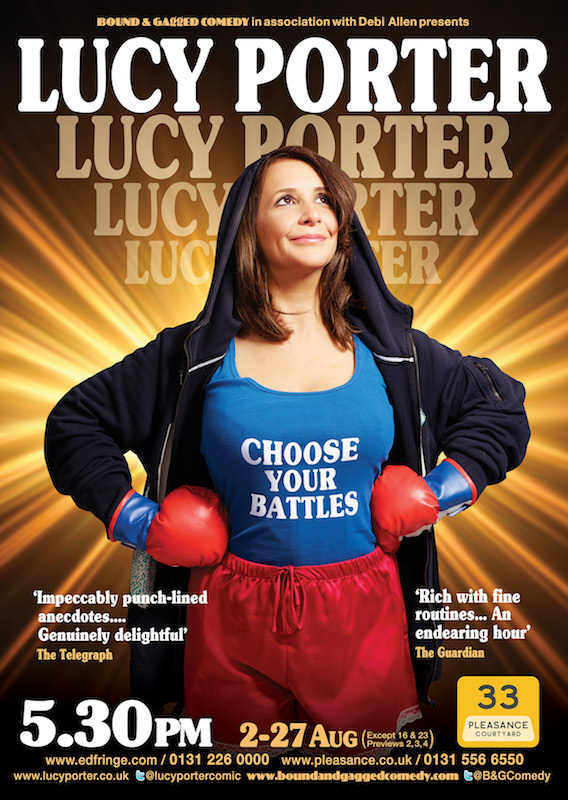 Lucy has recently starred in BBC’s ‘Live Floor Show’ and C5’s ‘The Comedy Store’. Her show last year was a total sell-out. This year, she presents a brand new stand-up show. She’s written for Johnny Vaughan and Adam and Joe. 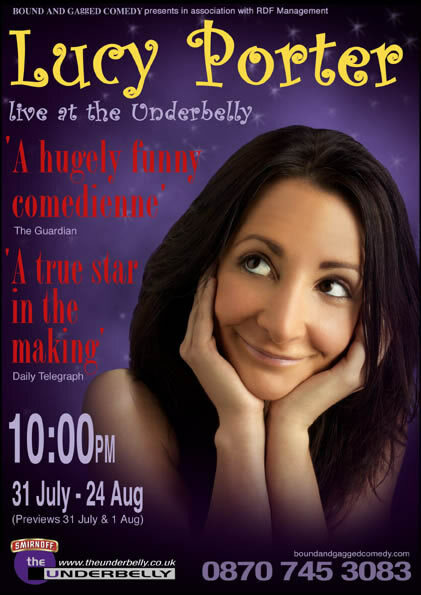 She’s starred in BBC1’s The Stand up Show and C5’s Comedy Store. Now she premieres her long awaited solo show.